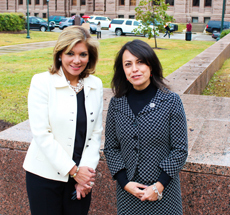 During the first day of the 83rd Legislative Session, I had the opportunity to visit with an exemplary Texan and a dear friend, Texas Supreme Court Justice Eva Guzman. Justice Guzman was the first Latina on the Texas Supreme Court. Texas has an amazing composition of justices who inspire children and young people across the state to dream big and to work hard. Texas is a place where extraordinary things can happen to very ordinary people through hard work and education. Below is video and transcript of her opinion on the 83rd Legislature and the role that the Texas Supreme Court has regarding laws: to simply interpret them. National Director of VOCES Action Adryana Boyne: Hello we’re here with TexasGOPVote and VOCES Action, and we’re here with our Supreme Court Justice Eva Guzman and we’re excited. Justice Guzman, thank you for giving us this time. Supreme Court Justice Eva Guzman: My Pleasure! Adryana Boyne: I would like to ask you, today is the beginning of the new session in 2013 and you are in the Supreme Court, can you explain a little bit to TexasGOPvote about the legislative process of the supreme court of Texas? Eva Guzman: Well you know they’re separate branches and the court is charged with statutory interpretation. So the Legislature makes the laws, we don’t make laws, we don’t pass laws, we simply interpret laws enacted by the Legislature and interpret them in a manner that is consistent with the expressed text of the statute that we may be reviewing. It is a very exciting day in Austin, the court is invited to the opening ceremonies, and our chief justice actually administers the oath of office to the Senators and our House Legislators, and so it’s a pretty exciting day in Austin and tends to be a very busy time. Adryana Boyne: Well we’re looking forward during this coming year and certainly you have about four more years right now? Eva Guzman: On my term, thankfully I have four years left. Adryana Boyne: Well we wanted to tell you that we are very excited that we have a great Supreme Court Justice and you are one of two women and the only Latina on the Court. We just wanted to congratulate you on all the efforts and hard work that you have done. Eva Guzman: Well thank you, it has been my privilege to serve Texas since 1999. First on the Trial Court, then on the Court of Appeals for almost eight years, and now I’ve been the Supreme Court of Texas since 2009 when Governor Perry appointed me to the Court. It really has been just a real privilege to be part of the process and part of the Judicial Branch and to really be a jurist who understands the role of the judge. It really is to interpret the laws and not to substitute our judgment for that of the people of the Legislature. So it’s been a true privilege, and I thank you Adryana for all the work you do, for our state, and for our community and especially for our friendship. Adryana Boyne: Well thank you very much. Well this is all for right now, but we look forward to have more time with our Supreme Court Justice Eva Guzman. Thank you.